The Queen of Swords represents the personality that results when the watery aspect of air manifests itself in a person; the intuitive, emotional, passive, intimate aspects of abstraction and ideology. 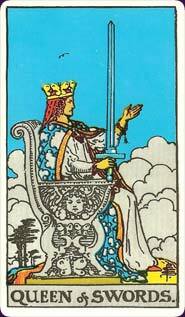 The Queen of Swords is Perceptive, able to see to the heart of the matter quickly, and is Just. She is Swift and she is also Independent and an Individualist. She is Confident and Balanced, as well as Graceful and Concerned over the treatment of others. She is Beautiful and people are drawn to her for that as well as her Wisdom. She is Articulate and to the point, able to come up with Clever and Fair solutions to any problem put before her. She is the perfect Diplomat, and one of the vehicles through which the ideals of the Suit of Swords will be brought to Earth. She is very Knowledgeable in the ways of the the human mind. She can be Cruel and Superficial sometimes, as well as Unreliable and sometimes outright Deceitful. She is Focused and will do whatever it takes to bring Peace, Truth, Order, and Justice to the world. King Solomon of Judean fame was a Queen of Swords; an empath whose feelings for others were driven by inspiration from a higher plane; in his case, God. The Rider-Waite art shows an imposing figure upon a throne, a sword in one hand and her other hand held out either as if she is expecting something or ordering others to do her bidding. She is not afraid to do what she knows is right and must be done. She is shown (unusually for the Rider-Waite Queens) in full profile, which gives her a stern air. The Thoth art shows a reclining Queen high in the sky. She is separate and believes she is above everyone else; there is an aura of untouchable beauty about her. This card also seems to emphasize her role as a judge, as she is above everyone else and can see what is going on, and dwells in the heavens, from where she can receive the divine word. In a reading, this card asks you to examine the role that this personality may play in your life. Do you know anyone who acts as an intermediary between others? Who always comes up with compromises and fair solutions to conflict? Do you know any individualists who others gather around to admire both their beauty and intellect? Do you know anyone who seems to just be good at everything? Reversed, this personality is blocked or hidden; perhaps someone is unwittingly mediating conflicts and disputes between others, or perhaps someone is trying to stop being that person.